Brilliant 18th century navigational manuscript explaining the antipodes. This is a page from a stunning 18th century manuscript treatise on navigation. 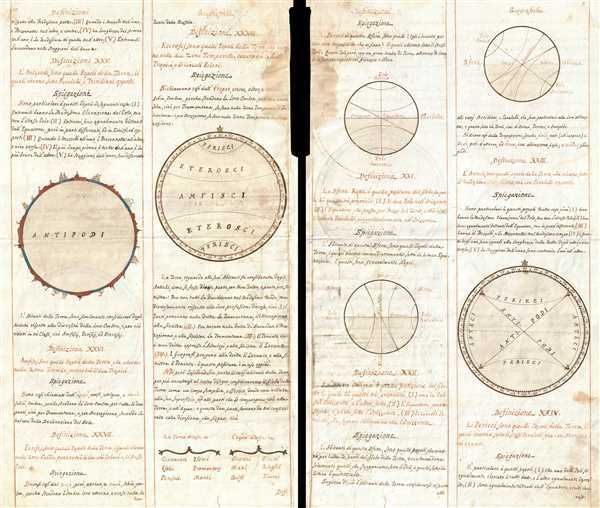 The treatise, Introdusione alla sfera e alla Geografia Moderna, alas, is incomplete. Definitions of geographical terms critical to navigation and geography are detailed, including antipodes. Diagrams are included which explain antipodes and other geographical phenomena. All text is in Italian and is on both recto and verso. We have provided a date of 1720, but this is merely conjecture. Based upon the paper and style, it is reasonable to assume this was drawn between 1650 and 1790. Good. Water stains upper right. Italian manuscript text on recto and verso.